Kindle DRM Removal quickly and easily remove Kindle ebook DRM protection with 1-click. Kindle DRM Removal produce a new AZW file that user can convert to EPUB/PDF/TXT/RTF format ebook using Calibre, read them on iPad, NOOK, Sony Reader or other device without limitation, user also can print converted Kindle ebook. Kindle DRM Removal is very easy to use, just 1-click to decrypt Kindle ebook. If you want to read Kindle ebook in Sony e-reader that bought from amazon.com, you will feel pain that Kindle ebook has DRM protection prevent you to do that, then you have probably discovered how annoyingly restrictive DRM technology is. You can try our software that removes Kindle DRM easily, convert it to other format that you can enjoy on practically any capable e-reader device. * No quality lose, the same quality as source ebook. * Create a .azw ebook without DRM, no need to backup the source files. * Decrypted .azw file supported by Calibre. Qweas is providing links to Kindle DRM Removal 3.4.1.220 as a courtesy, and makes no representations regarding Kindle DRM Removal or any other applications or any information related thereto. Any questions, complaints or claims regarding this application Kindle DRM Removal 3.4.1.220 must be directed to the appropriate software vendor. 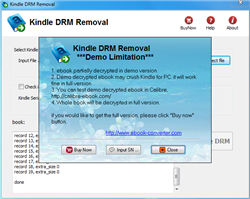 You may click the publisher link of Kindle DRM Removal on the top of this page to get more details about the vendor.